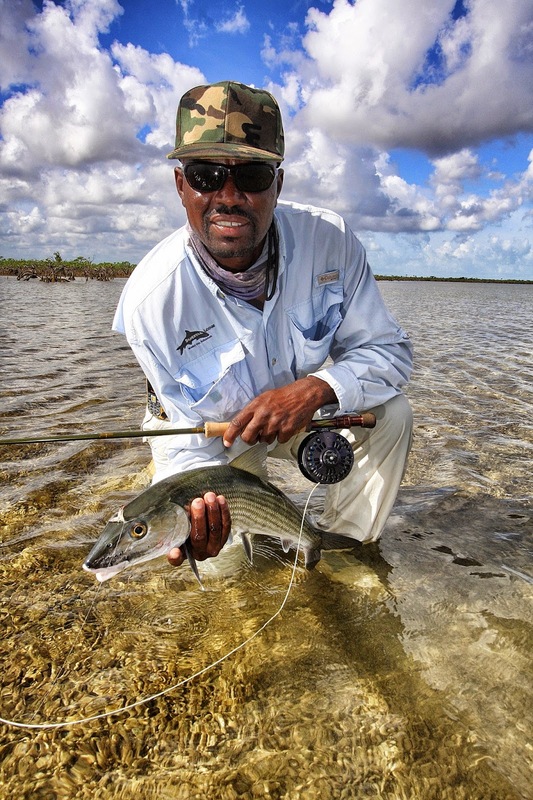 Water Cay Bonefish Lodge is a beloved destination… We now have anglers who are on their 10th trip to the lodge. 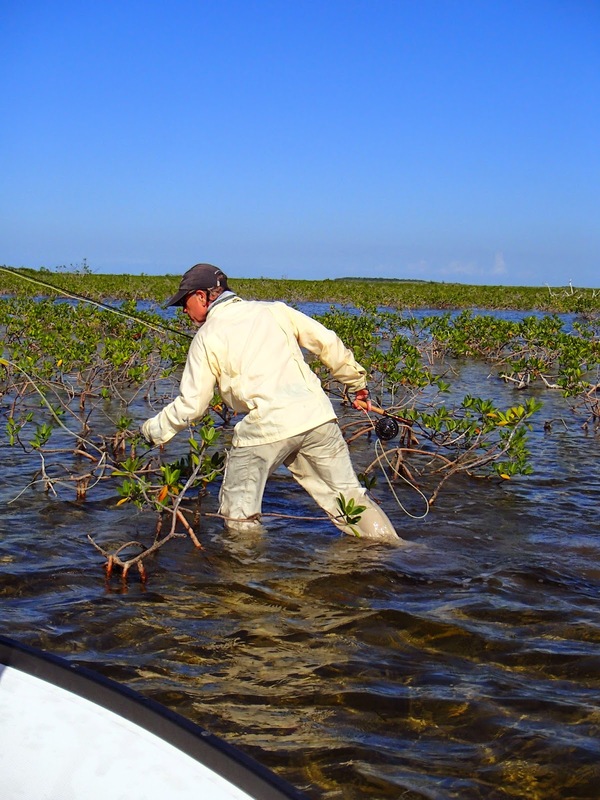 Water Cay is not for everyone, but if you have a keen desire to learn and like to fish hard… Water Cay Lodge offers a rare opportunity in what seems to be an increasingly amenities-driven angling world. 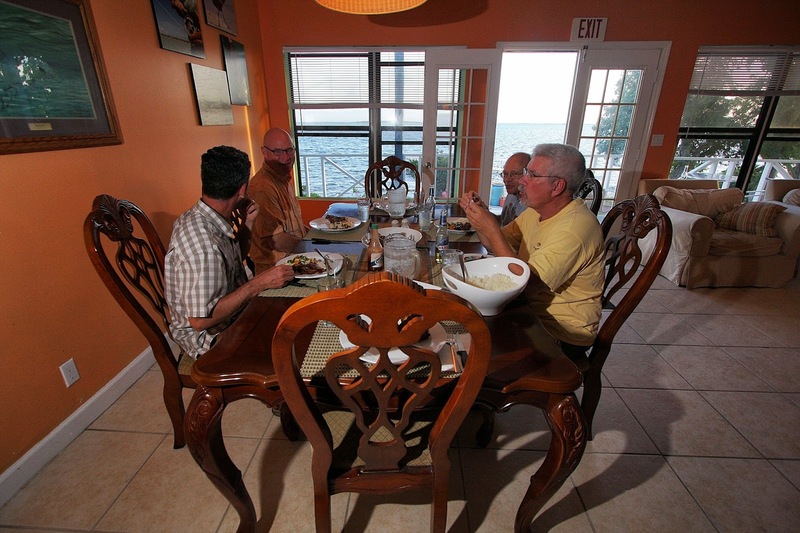 Water Cay offers a clean room and home-cooked Bahamian meals (yes, conch fritters! ), but more importantly truly great guides, Beavertail skiffs and a seamlessly organized day that gives you the best opportunity to pursue the island's big fish without the long runs to the flats. 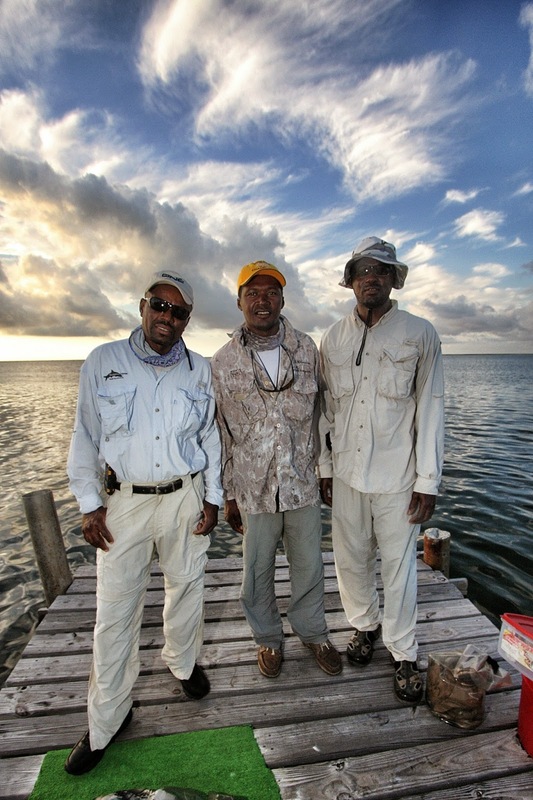 When visiting Water Cay, anglers are always amazed by the both the accessibility and vastness of this fishery. The soft breeze was headed south while the tide leisurely tugged water to the north. The moon now had a big chunk out of it, but last week’s full moon had been consumed by a total eclipse which had created historically high tides. 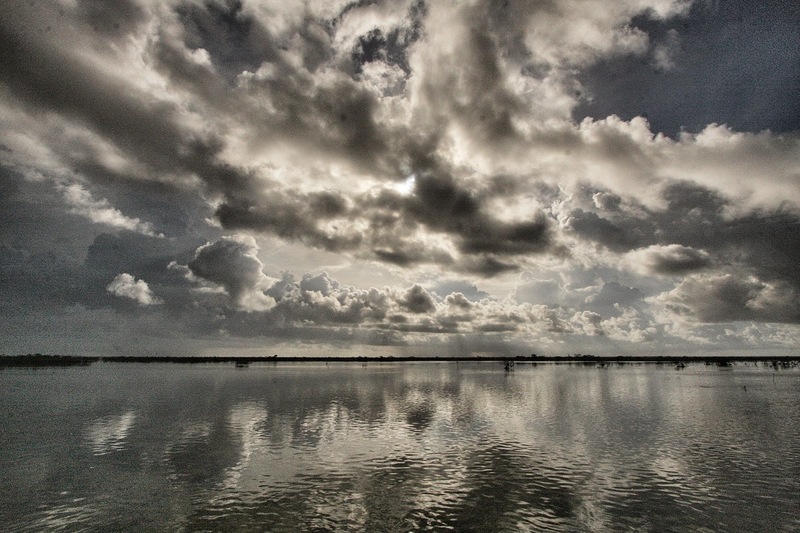 Last week, the bones had followed this flood up and ultimately through the mangroves until they were stopped where the pines and palmettos began. 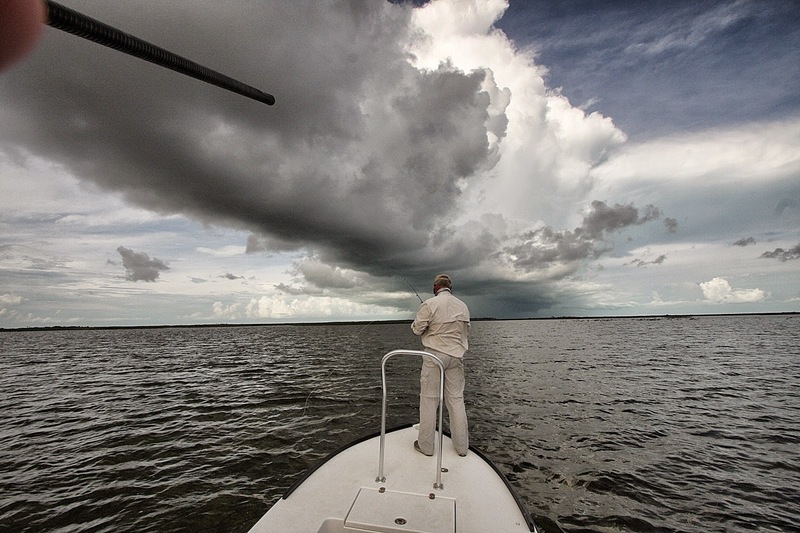 The bonefish had reached areas they had never seen before except during the violence of hurricanes. 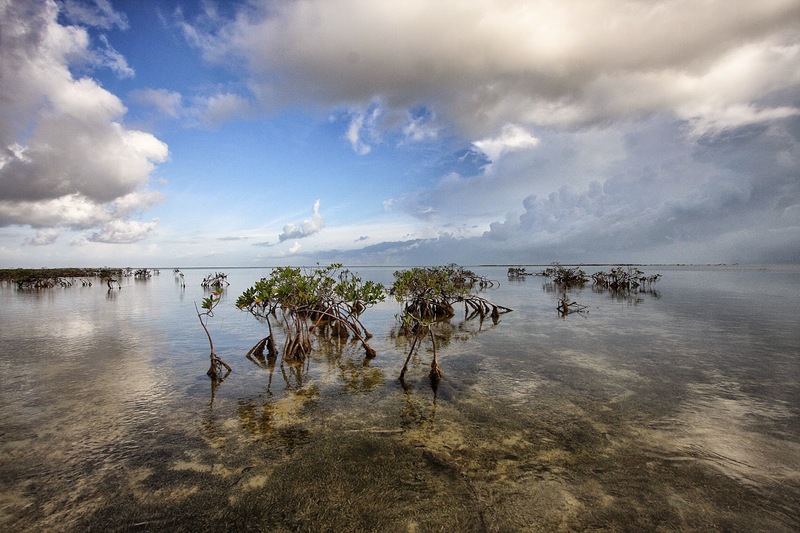 Last week docks had been flush with the water line, lawns were flooded and only the very tips of the mangrove bushes could be seen above the water’s surface. 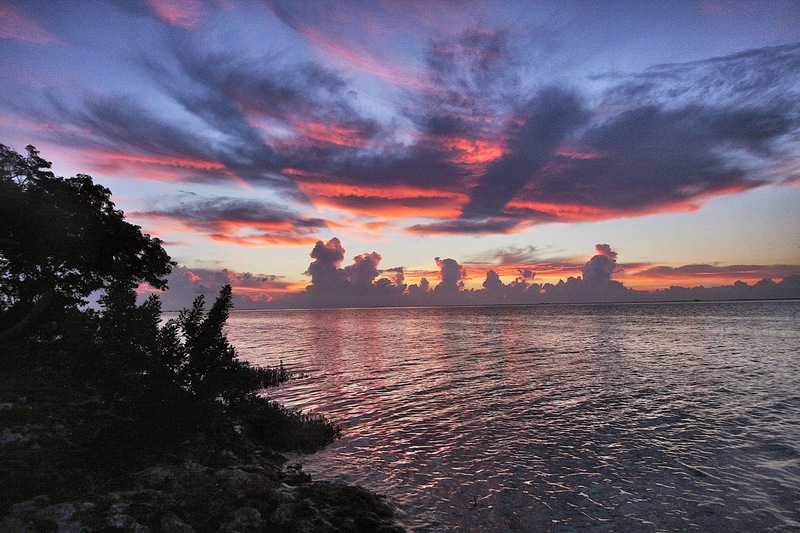 The last mile of the crushed coral road to Water Cay’s dock was under 12-18 inches of water. We had parked the pickup on the only small mound of crushed coral that remained. The pickup, its hubs still dripping with seawater, seemed to float next to the Beavertail skiff moored beside it. But now, six days later, the tides were fully neaped. 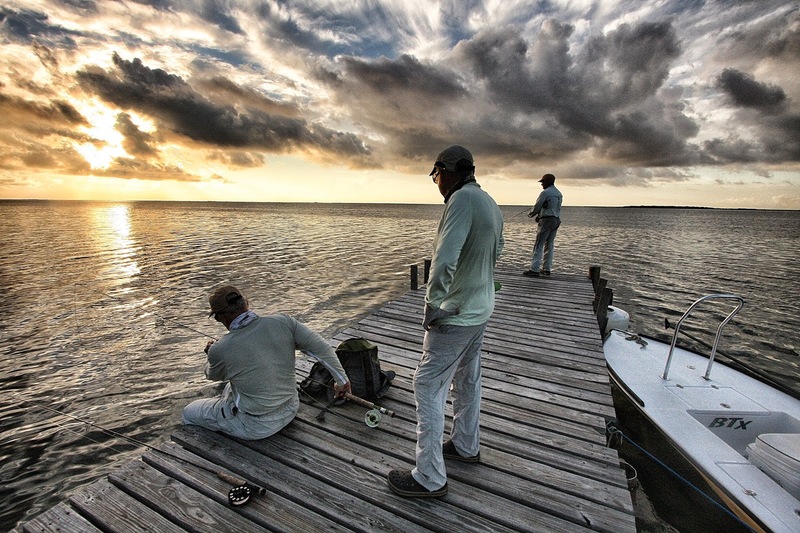 The waning moon, light winds and a cloudless sky had created a perfect bonefish morning. If somehow you could bottle this morning and take a sip of it whenever you really needed a break from winter, January in the north would be much more tolerable. To add to this perfection, I was fishing with my friend of 25 years, Steve Peskoe, and guide extraordinnaire, Sidney Thomas. 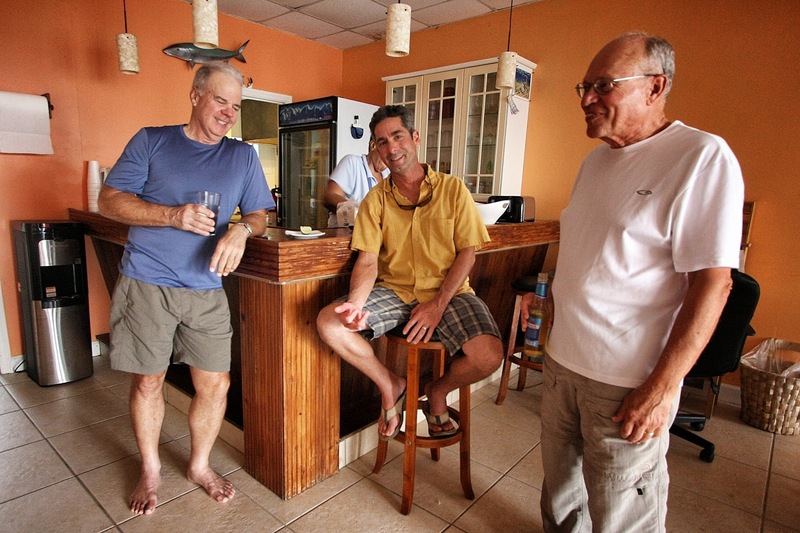 To my mind, Sidney is one of the Bahamas’ top guides. 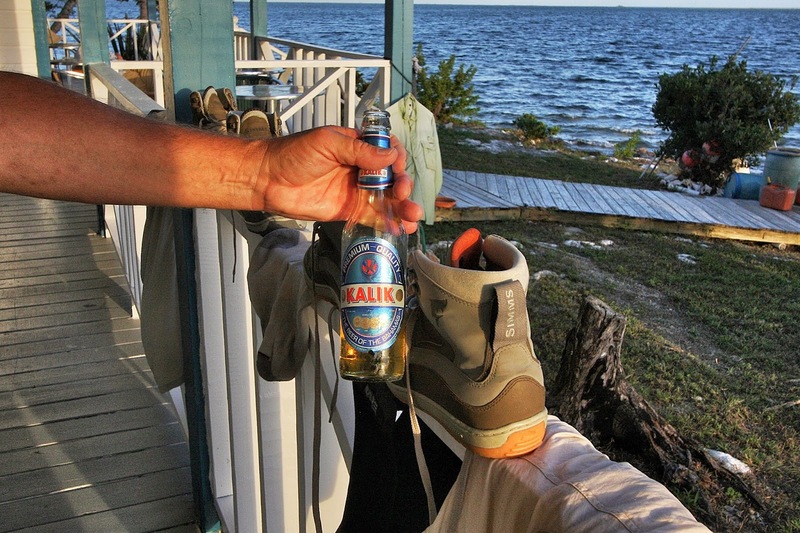 If there was an Bahamas All Star Guide team, Sid would be starting. 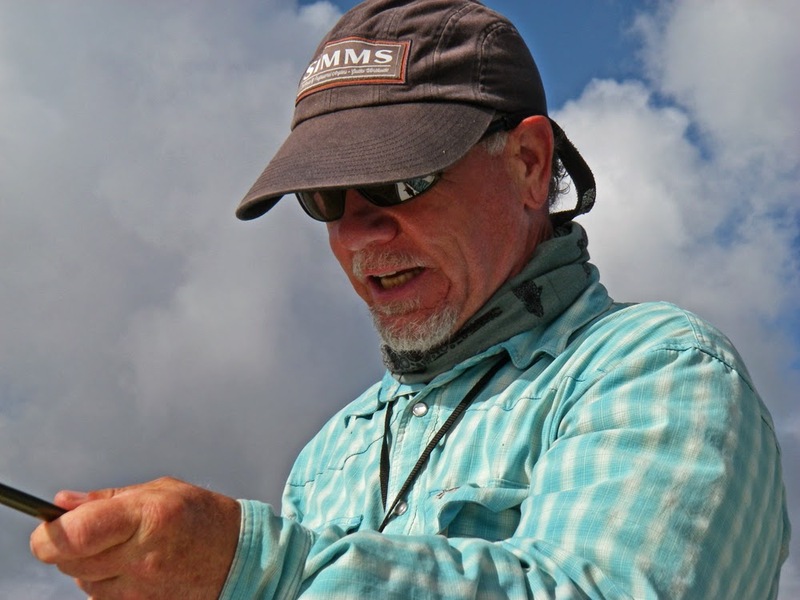 Not only is Sid great at finding and spotting fish, he is a terrific and patient instructor with an amazing command of the subtleties of the sport. 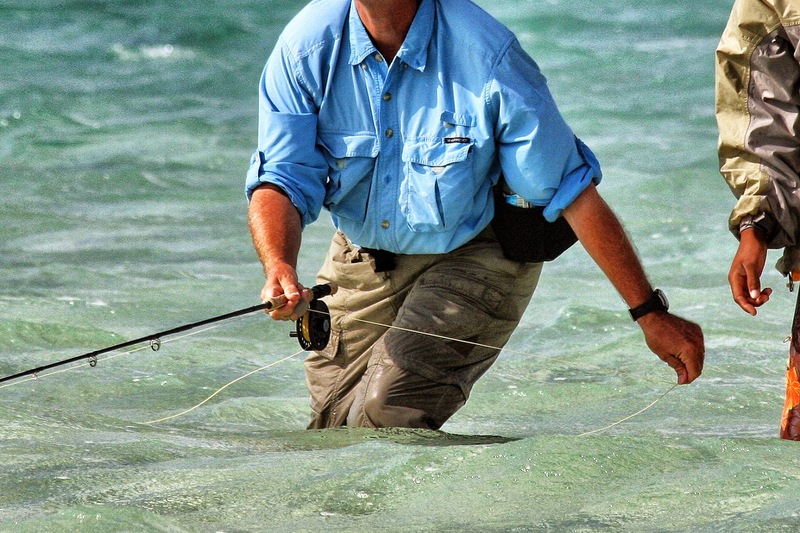 If you are an expert bonefisherman, he can make you even better by putting a few subtle skills in your quiver. If less skilled, Sid can take you through the process and put you on your way. 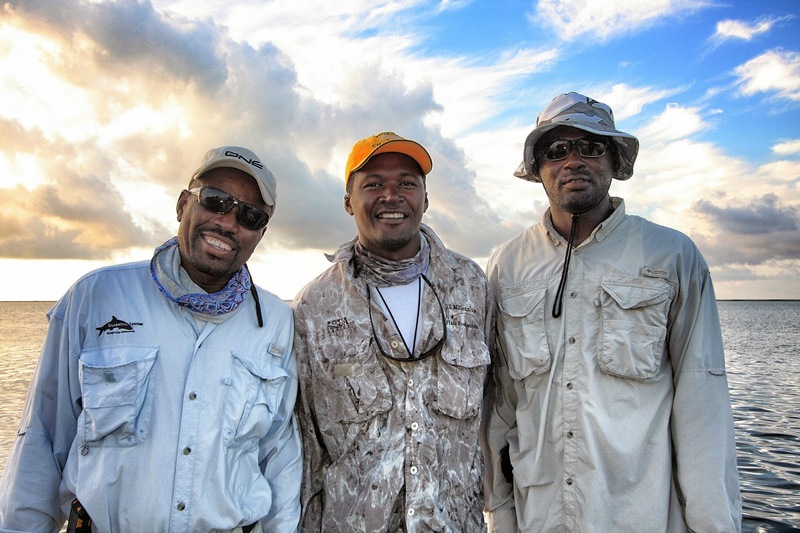 Greg Rolle, Sidney Thomas and Ezra Thomas… The best guide cadre in the Bahamas! 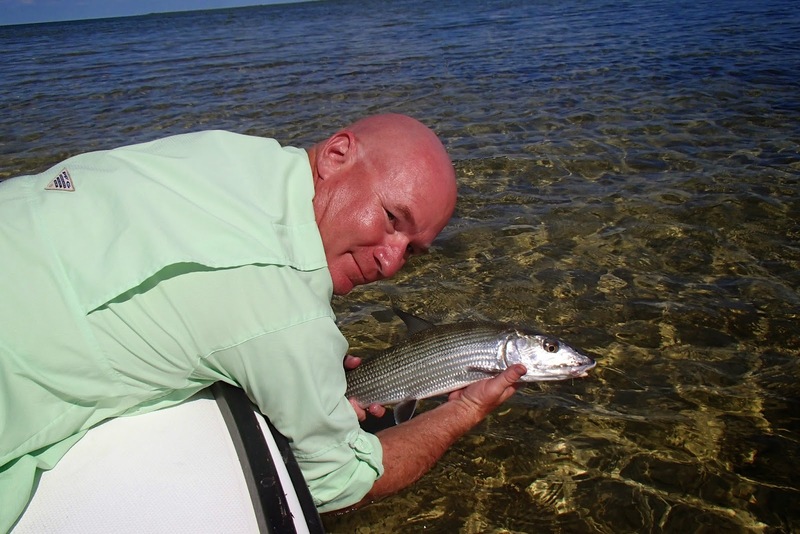 As Sid poled quietly on the rocky bottom at the north end of Water Cay, I saw a slight swirl next to shore. The water moved like a lightly stirred cocktail. Sid had of course seen the swirl too. We both were watching the spot intently when a tail popped up. 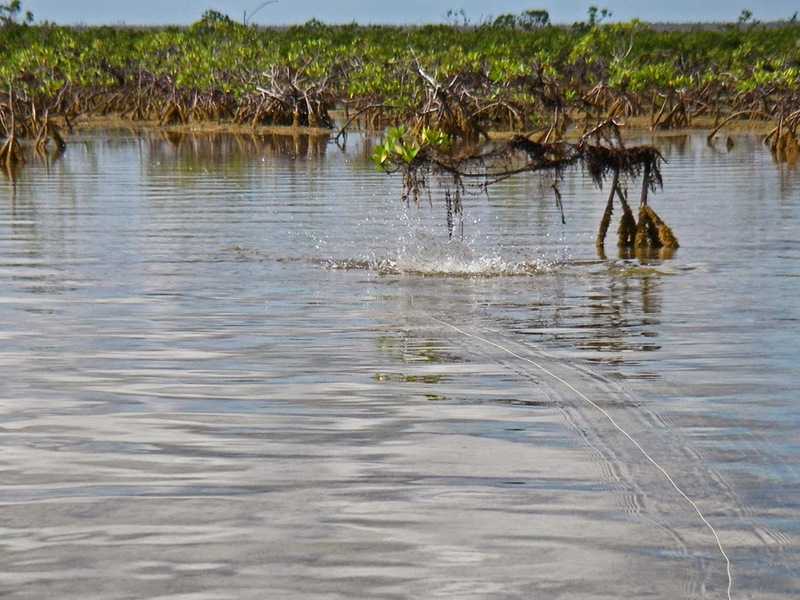 I flicked my fly forward, rolled it into a backcast, aimed it on my false cast then dropped the fly 50 feet near a small mangrove. As my fly settled, another tail popped up then charged ten feet towards my fly. Two more bones were in close pursuit. A long slow set-strip brought me tight. 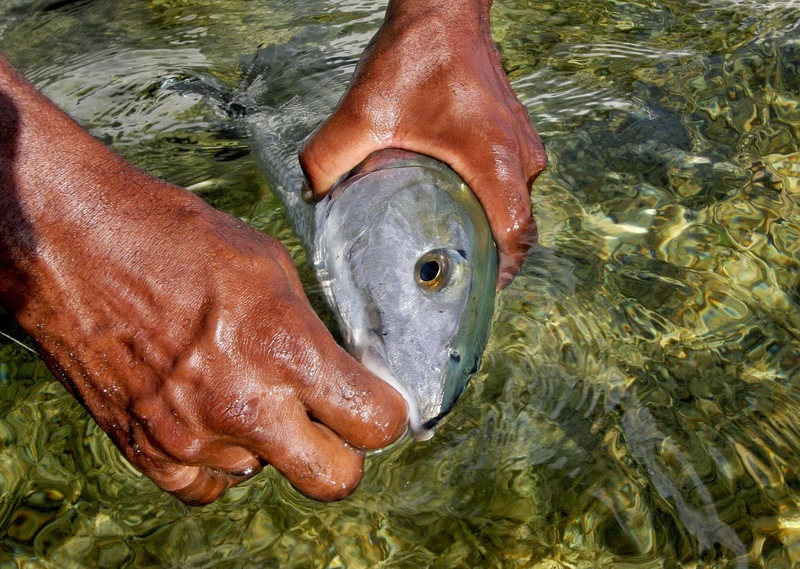 I was soon into my backing struggling to keep another strong Grand Bahama bonefish out of the mangroves. I cranked my drag down then palmed my reel straining the 12 lb. tippet. Sid stabbed his pole at the juiced-up shark. The blacktip moved off a bit. I pulled the bone’s head up and surfed him into Sid. He flipped the fly out and the fish was quickly on its way. He was five pounds of muscle and nerves still seemingly robust enough to avoid the shark if he came back. 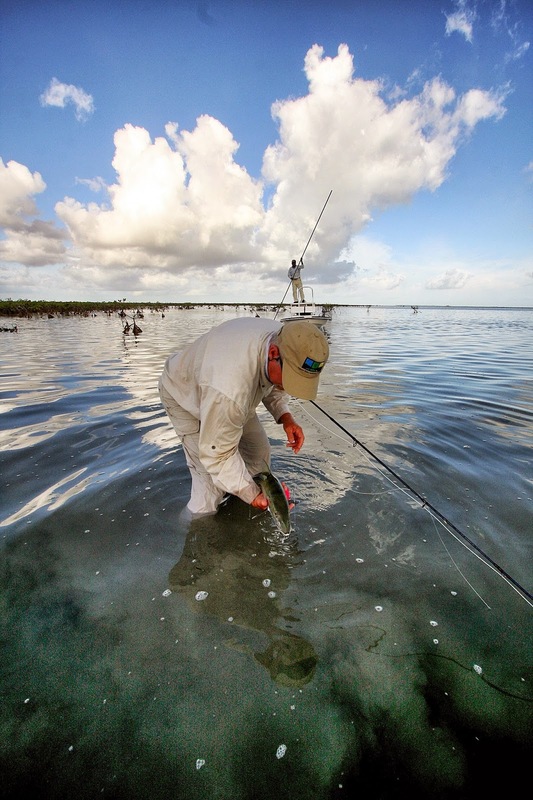 After this first fish, we headed north finding fish on interior mangrove flats and outside beach flats. The fishing was classic and very engaging. Big singles and doubles appeared often enough to keep our attention focused, but not so often that we didn’t get that snap-to-the-core feeling when one was spotted. The wind and weather remained perfect. We eventually left these beautiful flats and headed north again. As we got further from Water Cay, the water changed in character. Rich turtle grass gave way to white sand and the amber marl was replaced with the endless pale blue waters of open ocean banks. While up on a plane running from one small cay to another, I was digging in my backpack when Sid turned abruptly back towards his wake. I thought someone’s hat had blown overboard. “We ran over a big ray that had two permit on it.” Sid yelled excitedly. I grabbed my rod before we came off plane and jumped to the bow. All I had within easy reach was my bonefish rod. It would have to do. “Now we just gotta find the ray again.” Sid whispered. “There he is.” I said as a lump formed in my throat. 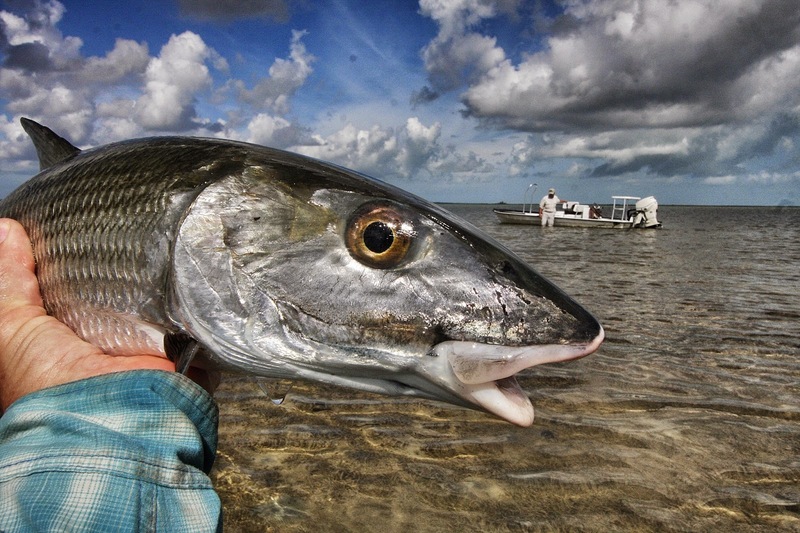 “I only have my bonefish rod.” I told Sid. “It might do.” Sid advised knowing the permit must be nervous since we had run the boat so near them. We might only get one quick shot. I could see two permit on the back of the huge ray. They were big... in the 25-35 lb. range their species unmistakeable in the clear calm water. I sent a cast two feet over the ray’s back. One permit left the ray to take a look, but he did not eat. I made another cast towards the rear of the ray, but both permit moved off the ray and away from us. They hesitated for a moment, then effortlessly slid away covering 100 yards in one then 200 yards in the second heartbeat. And trust me, heartbeat is the proper word to use. Mine was pumping so hard I could feel my pulse thumping in my ears. I knew I had just experienced “a shot”. We could clearly see the permit going away at 300 yards when another big ray came in towards us from the east. Damned if there wasn’t a permit on this ray too! Then the two permit who spooked off crossed the contrail of this second ray and tracked it until they joined this third permit. Now we had three permit and three fishermen locked on one ray. I was enthralled. “Should we try to get the permit rod out?” Someone whispered.. I honestly don’t remember who. Steve and Sid quietly opened the latched compartment and silently pulled out my permit rig. I stripped line off the reel as the ray swam closer. I made two good casts that each time got a permit’s attention, but garnered no eat. The permit got progressively more nervous with each cast and eventually left the ray. I stood there not dejected or defeated, but thrilled to have had this experience and gotten this shot. It was truly the best time that I have experienced in a long time without catching a fish. Eventually, we gave up trying to find the permit again and moved into a small bay filled with bonnet sharks and small lemons. 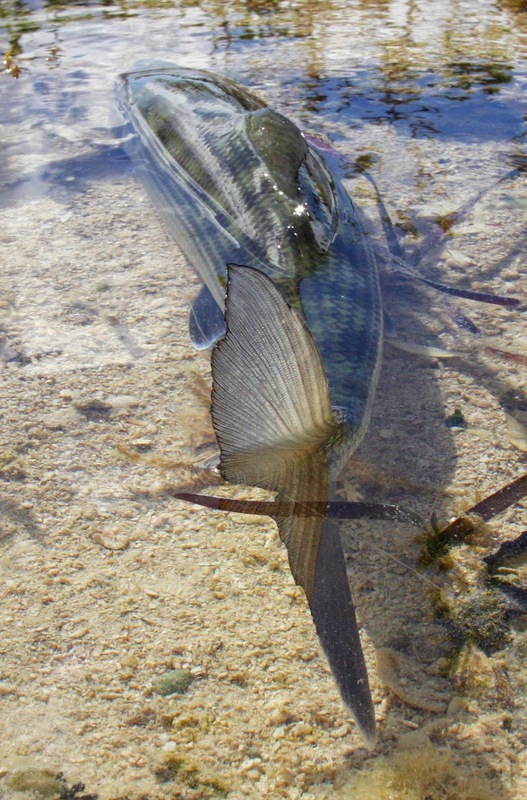 The sharks were everywhere, but so were the bonefish. Steve and I traded fish for over an hour. 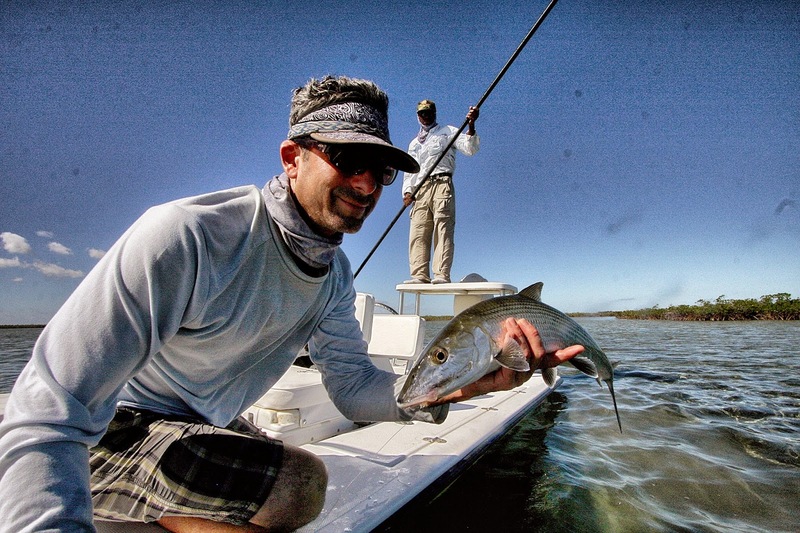 It was stupendous fishing and during this session, we got a clinic on bonefishing from Sid. Now I’ve bonefished for 40 some years and on this day, I went back to graduate school with Professor Sid. 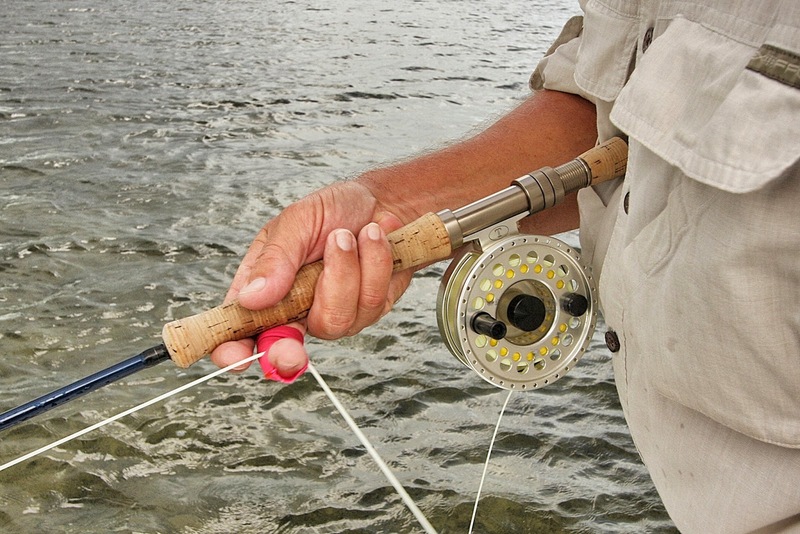 We refined everything from the cast, to the retrieve to the hookset. On this magnificent calm morning, we could see every reaction by the fish to our flies. As such, this seminar was not theoretical and we were not simply following Sid's orders. On this day, we were in the lab and the effects of everything Sid suggested could clearly be seen. (I’ll make a post on this soon). 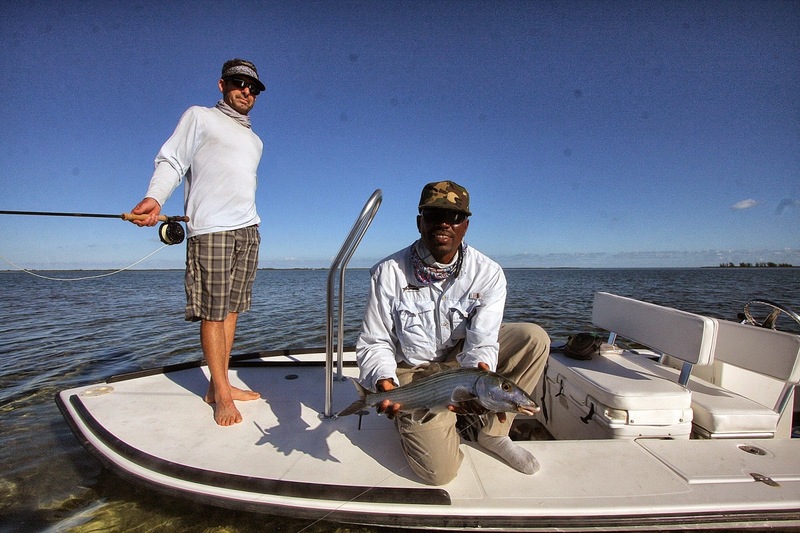 Greg Rolle and Mike Schwartz with another "average" Water Cay bone! The fish were tough and easy to screw up. 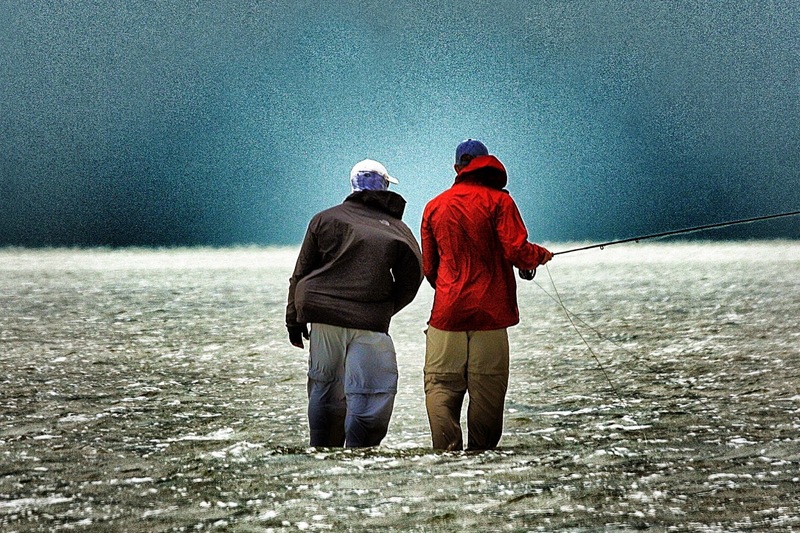 They would not tolerate a sloppy cast, or too fast a retrieve or less than subtle hookset. Everything had to be just right. Under Sid’s tutelage, we caught lots of fish, but more importantly, we learned a great deal. Our perfect day had gotten even better. 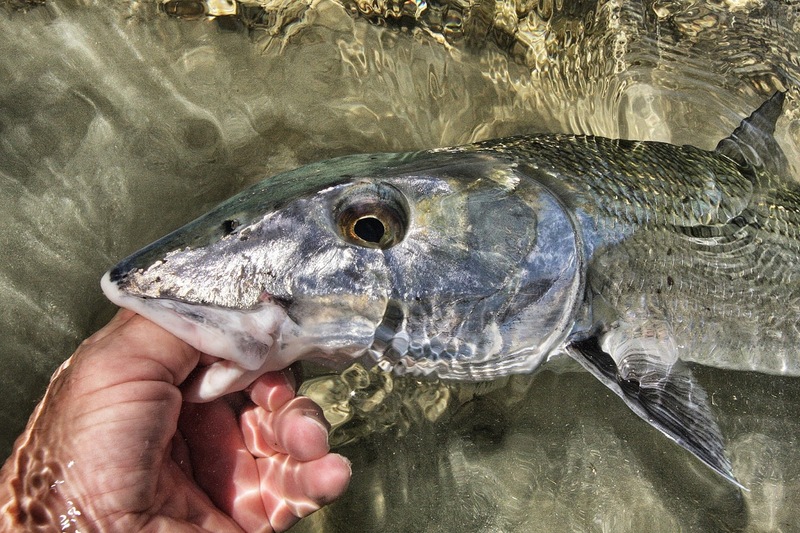 After leaving this bay, We had lots of great moments: the bruiser in the mangroves (we called him Einstein) that after a classic sequence of a long cast (between two mangrove shoots in a mangrove choked bay), perfect retrieve and a Sid endorsed hookset, resulted in no catch. When hooked, Einstein ran right at the boat for 60 feet dragging the fly line, but not allowing me to come tight. Eventually and predictably, he came unbuttoned. This was fine with me as we never would have landed him in the midst of all these mangroves. Then there was the double-digit bone that was being shadowed by the three foot lemon shark. The lemon was there not to try and eat this big bone. He was looking for leftovers much like the permit on the rays. This big bone was excavating huge holes in the firm bottom often standing on his head waving his big broad tail like a pennant in the wind. This big fish was, at times, in such shallow water that I could see his eye and broad back above the surface. Amazing! 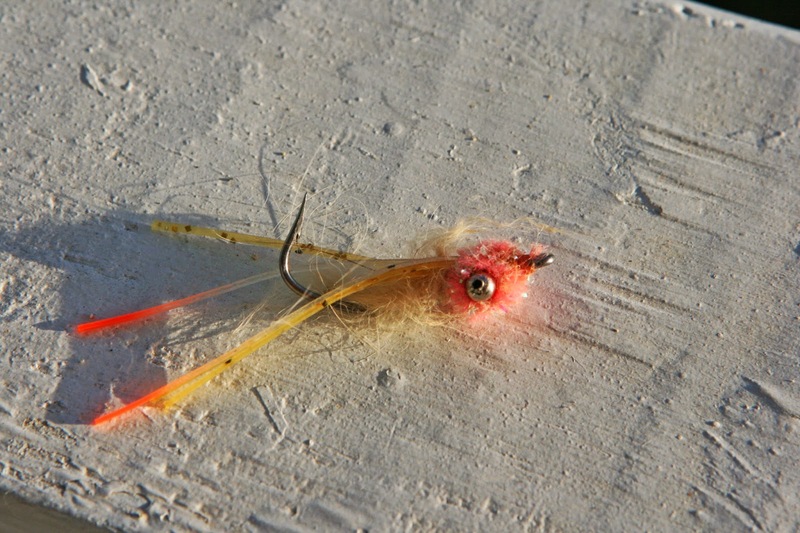 Of course, I never caught him, but he did follow my fly for 10 feet as it was slowly moved by the tide. He examined it like jeweler would studying a diamond. Apparently he found just a few too many flaws in my fly to “make the purchase”. This was just one day of our six days. I had a wonderful first day with Mike Schwartz when we fished a meandering backcountry creek on a rising tide with the superb guide Greg Rolle. Lots of fish caught… lots of great moments. I had another very successful morning with Doug Jeffries when we traded tailing fish for three hours. I have no idea how many we caught. It was never easy and always cool. In the morning light, we stalked tailers in the slicks next to shore. With Greg Rolle poling the skiff silently, Doug and I had a period where we caught nearly every fish we saw. Thanks Greg!, but I think this was a testament to your stalking and spotting skills more than our angling acumen. 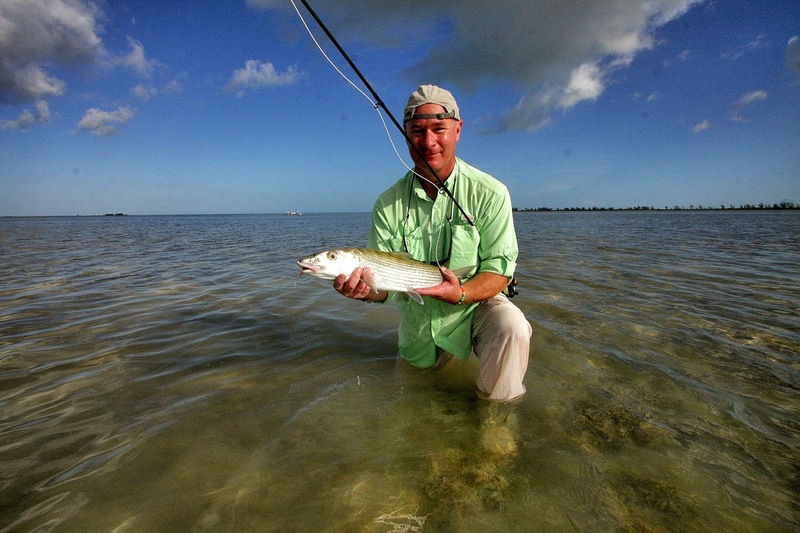 Jeff Rodenberg with an excellent skinny water tailing bone! There were lots of other great moments… the great tails in the bay with Jeff Rodenberg, the endless singles with Scott Sawtelle when we got yet another invaluable lesson from guide Ezra Thomas (who would most certainly be on that same starting team with Sid). It goes on and on… what a great trip. So great, I have a week next October reserved!